SkinMedica Scar Recovery Gel works...and you should try it! 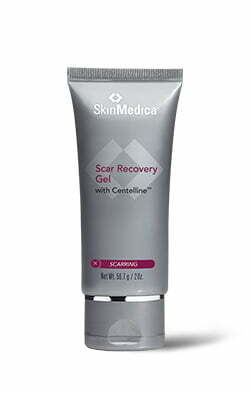 Home » Blog » SkinMedica Scar Recovery Gel works…and you should try it! SkinMedica Scar Recovery Gel works…and you should try it! The short answer is: yes. One clinical study showed that 80% of patients treated experienced a reduction in the appearance of their scars. Why does this work better than other products? The active ingredients in SkinMedica Scar Recovery Gel create Centelline which is a first-of-its-kind complex that is proven to hydrate damaged skin, stimulate collagen production and repair wounds and scars. When compared to over-the-counter scar creams, it does appear pricey; however, this product works. Our patients feel as though it was money well spent. You can also look at online reviews at Amazon.com where it’s ranked with the highest five star rating. Does it work on old scars? Scars can take a year or longer to finish forming. By starting this product anywhere along the way, you are helping to minimize the appearance of your scar or scars. If you have more information or are interested in purchasing scar gel, please call our office at 610-320-0200. Remember, you don’t have to be a cosmetic patient or a patient of ours in order to purchase the scar gel. No matter what your scar, it will work! 8 Ways to Feel More Energized!